Margaret (Aunt Toots) Leona Rhode, age 91 passed away early Sunday morning April 15, 2018 at West Woods Nursing Home in Bridgman, MI. Margaret was born November 29, 1926 in South Bend, IN; the daughter of Cecil and Elsie (Schultz) Shank. She was united in marriage to Elmer Rhode in 1948 at St. Matthew’s Church in Benton Harbor, MI; he preceded her in death in 1981. 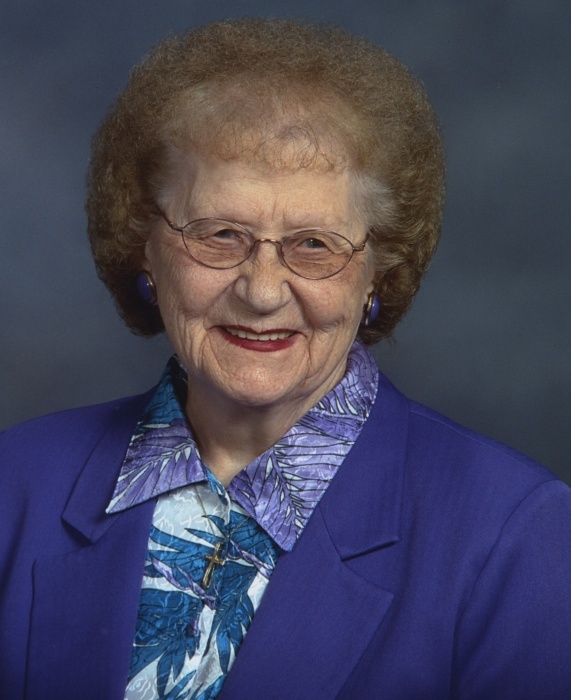 Margaret was a long-time member of the Trinity Lutheran Church in Paw Paw, MI where she served as church secretary and a member of the Altar Guild for 37 years. She loved to polka at dances and wedding receptions, play cards and other games with her sister, brothers, and nieces and nephews. She especially loved spending time with her family on holidays and summer picnics; but most of all, she loved her Lord, her family, friends, and church family the most. Margaret is survived by her son; Kurt L. Rhode of Tampa, FL, niece Priscilla (Ron) Goodline, Ragena (John) Marsh, nephews David (Katherine) Schuld, Brian (Lori) Shank, and Douglas Hess; great nieces and nephews; Terri Timmons-Heinz, Denise Knight, Debbie Rimpel, Chad Goodline, Lorna Dillard, Kristine Cunningham, Angela Marsh-Peek, Amanda Gaul, Matthew Schuld, Katherine and Emily Shank. Margaret also had sixteen great, great nieces and nephews and nine great, great, great nieces and nephews. Most considered her more as their grandmother than as their aunt and they loved her dearly. She always remembered their birthdays and special occasions and made sure she was a part of their lives. Besides her husband Elmer, Margaret was preceded in death by her parents, a sister; Dorothy Ostrander, two brothers; Cecil Shank Jr. and Warren Shank, and a niece, Judith (Charles) Timmons. Funeral Service for Margaret will take place Wednesday, April 18, 2018 at 11:00 AM from Trinity Lutheran Church, 721 Pine St. Paw Paw, MI 49079. Visitation for family and friends will take place at 10:00 am until the time of services; Pastor Eric Gledhill to officiate. Cremation to follow services and inurnment to take place at a later date in Wildey Cemetery, Paw Paw, MI. In Lieu of flowers, memorials can be made to Trinity Lutheran Church in her name.